It has been a tough last year for precious metals investors but not so much for common stocks. Sure, the euro crisis benefited gold initially but as the panic has abated, stocks are rallying back to their highs while gold has sold off and the gold stocks are trying to hold their lows. What is going on? Are we in the twilight zone? Bull and bear markets are long lasting, providing ample time for trends and counter trends to continually reappear and redevelop. 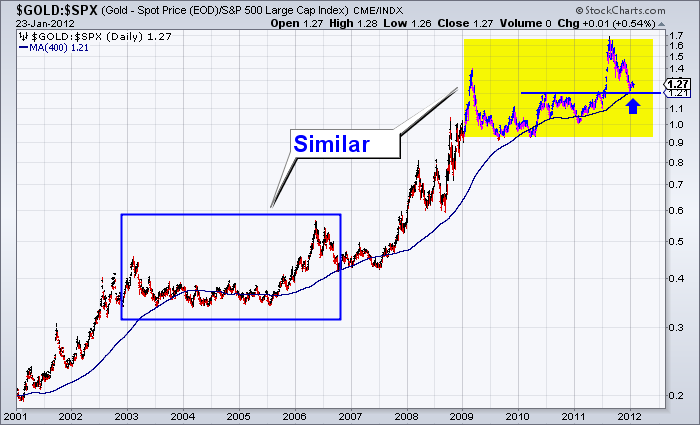 The long-term activity of precious metals and common stocks is not a mystery. Gold has continued to hit all-time highs while the gold stocks eclipsed and maintain 2008 highs as support. Yes, common stocks are rallying but are nowhere close to seriously testing 2008 highs. Recently, we noted a potential major bottom in both the metals and the mining stocks. With common stocks nearing major resistance, it is no surprise that we are nearing a point where the secular bull trend is ripe for reemergence. The chart below shows gold against the S&P 500. 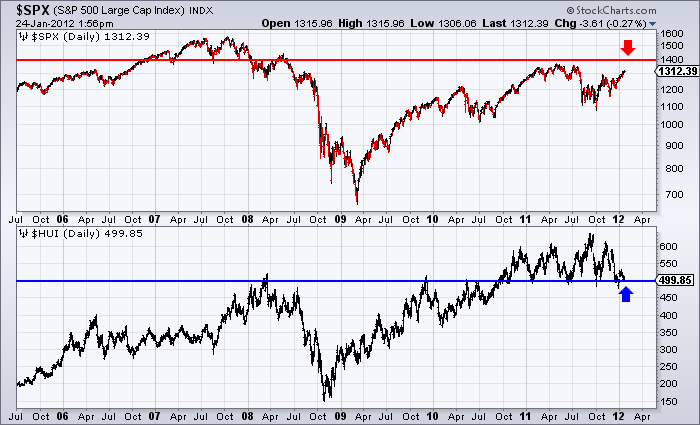 Note the similarity between 2003-2006 action and 2009-2012 action. After surging higher, the ratio retreats quickly but then forms a bottom and builds a base. The ratio has found strong support and won’t be going lower anytime soon. Stocks have had a nice relief rally against gold but it looks to be all but over. 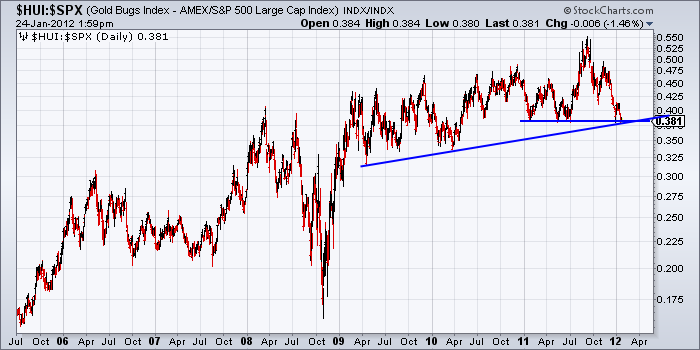 Turning to gold stocks against stocks, we find this ratio at a confluence of support. Yes, the mining equities had a difficult 2011 but it was nowhere close to their severe under-performance in 2008. Technically, the ratio looks likely to bottom soon and reverse course. Investors and traders have to monitor charts and also sentiment which tells us more about fund flows and risk versus reward. Below is a screenshot of a new indicator developed by sentimentrader.com. They are combining put-call ratios, short interest and analyst ratings to develop another indicator for the various sectors. As you can see, every sector is either at or very close to a sell signal while the gold stocks are the only sector on a buy signal. It may take a few months but common stocks are nearing an important peak. They won’t crash but they will act typical of what we see in the last third of a secular bear market. Doom and gloomers and extreme deflationists ignore the obvious reasons why stocks will begin a mild cyclical bear market and nothing of the sort of the previous two bear markets. At the same time, the precious metals sector is set to emerge from a major bottom and spend 2012 working its way towards the next major breakout that will serve as a catalyst for the beginnings of a bubble. If you’d like professional guidance in riding this bull market and uncovering the winning companies here's more about our premium service.